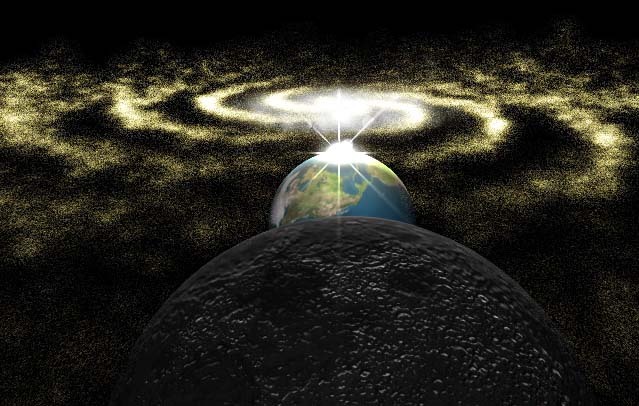 God created the primal elements, and the Ruach of God brought order to the primal elements. Here is the Fundamentalist reading of Genesis 1-5. God created the world between 6000 and 10,000 years ago. God created Adam and Eve, the first human couple. Eve gave birth to a son named Cain (Kain/Qayan/Kayin/Kenan/Kahn). After Cain killed Abel, God granted Eve another son, Seth (Set/Seti/Ta-Seti). Cain's line was cursed and died out in a worldwide flood. Only Seth's line survived and no other peoples were on the surface of the Earth. Noah and his 3 sons and their wives are descendants of Seth only. The Earth was re-populated after the flood by Noah's 3 sons. If humans have been on the surface of the Earth for over 3 million years, and Adam and Eve represent the first created humans, then there is a gap of time between Adam and Eve and Cain. How then are we to interpret Genesis 4:1? Fundamentalists insist that Cain is Eve's offspring. The Hebrew text suggests that Cain is Eve's royal descendant. The creation stories of Genesis 1 and 2 have a specific historical-cultural context and should be understood in that context. These stories come from the ancient Afro-Asiatics who believed that the first substance on Earth was chaotic water and the Breath (ruach) of God moved over the water establishing order. The Breath or Spirit of God separated the waters above from the waters below and the dry land from the seas. They also believed that blood (dam in Hebrew) is what constitutes Being. The word Ha-dam means the blood or the Being, and this is the likely etymology of Adam (Human Being/First Man). The earth is about 4.5 billion years old. This is based on radiometric age dating of meteorite material and the earth's oldest rocks, and is consistent with lunar samples. Fundamentalists argue that radiometric dating is not reliable because it contradicts what they believe the Bible says about the age of the Earth. For the sake of argument, let us consider that radiometric calculations are off by 50%. Were this the case (and it is not), the earth would still be over 2.2 billion years old. The oldest human fossils are about 3.6 million years. Again for the sake of argument, let us consider that the carbon dating of the oldest human fossils is off by 50%. These humans would still have lived over 1 million years ago. Bishop James Ussher's scheme did not recognize that the "begats" of Genesis are not generational, but regnal. All the men listed are kings and the reigns of some kings coincided. For example, Tubal-Cain (Gen. 4) and Methuselah (Gen. 5) ruled at the same time over different territories. Further, the names of these rulers are not proper nouns; they are honorific titles. Terah means priest. Cain/Kain means king. The female equivalent is Kandake/queen, which is rendered in English Bibles as the proper name Candace. Enoch means "one to ascends to the throne." Lamech is a variant of la-melech which appears on several thousand Egyptian seals. It means "of the King" or "for the King." 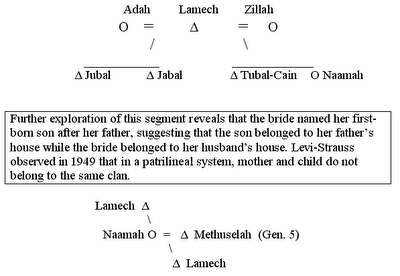 Lamech the Elder's daughter was Naamah, another word associated with Abraham's ruler-priest ancestors and descendants. Naamah is a royal name as attested by the connection to King David. The royal mother of one of David's grandsons was Naamah (II Chron. 12:13). The human knew Havva his wife, she became pregnant and bore Kayin. She said: Ka-niti (Qanithi)/ I have gotten a man, as has YHWH. E.A. Speiser noted that Qany(ty) or Qan-itti shows close affinity to the Akkadian itti, as in itti šarrim which means "with the king". Cain is associated with the concept of rule or dominion among ancient Nilotic peoples. Genesis 10 tells us that Nimrod was a Kushite, so it is not surprising to find that Akkadian shares many words with Nilotic languages. Among the Oromo of Ethiopia and Somalia, itti is attached to names. Examples include Kaartuumitti, Finfinneetti and Dimashqitti. That itti is associated with Nilotic rulers is evident in the name Nefertitti. If we take Eve to be the first woman created by God, we must place her creation before the oldest human fossils at about 3.8 million years. This poses a problem. Is it possible that Genesis 4:1 is speaking of Eve as the ancestral mother of the kings (ka-ntr) listed in Genesis 4, 5, 10 and 11? Is this another prophecy concerning the King who was expected to overcome the grave; a parallel to Genesis 3:15 concerning the Seed born of the Woman (not Eve)? 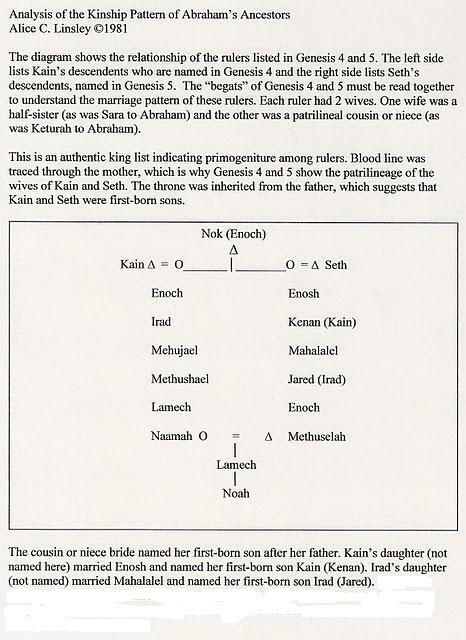 Among Abraham's ancestors the ka was provided by the mother. It refers to life or essence. The word ntr refers to ruler or king. It appears from Genesis 4:1 that Eve is declaring that she has given life to a king, such as is the Lord. The Epistle of Jude alludes to Cain as a king, along with the prophet Balaam and the priest Korah (verse 11). Kings, prophets and priests were the three highest offices in Biblical times. Further, Genesis provides many anthropologically significant details that point to Cain's status as a ruler. He was a tiller of the soil (Gen. 4:2) which means that he controlled an area of land, as did Noah, one of his descendants, who planted a vineyard. He was a city builder (Gen. 4:17) as was his descendant Nimrod who built cities in the Tigris-Euphrates Valley. These cities were shrine cities or sacred centers within the ruler's territory. Cain is associated with metal working. One of his descendants, Tubal-Cain, is said to be the “father” of smiths. In the ancient world, Smiths were a caste with high social status. They were in the service of the rulers. 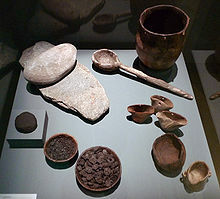 In the Upper Nile, Badari smiths smelted copper during the Chalcolithic or Late Neolithic Period (about 4000-2,800 B.C.). However, the Badari smiths used ritual flint knives for circumcision, as did Moses' wife, Zipporah, when she circumcised their son. Relics of this period found at Al-Badari include necklaces, beads, copper pins, fine linen cloth, and elaborate grave offerings. Al-Badari is on the Upper Nile at the border of Egypt and Sudan. Cain offered sacrifice to God (Gen. 4:5). In the ancient Afro-Asiatic world only ruler-priests offered sacrifice. Cain married a royal daughter of the House of Enoch (Nok). Only rulers married the daughters of rulers. She was his cousin as evidenced by the following analysis of the Genesis 4-5 marriage and ascendancy pattern. We see from this analysis that Cain as a "son" of Adam and Eve must refer to the fact that kings came from the first created couple, but this particular Cain/King lived long after Adam and Eve. The founding father of the lines of Cain and Seth was Enoch/Nok. Enoch comes from the African word anochie, meaning one who is to ascend to the throne. 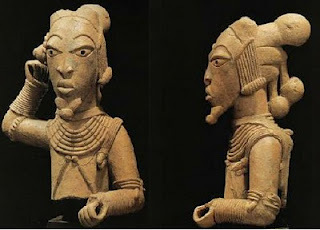 The Nok civilization is found in the part of Africa from which Abraham's ancestors came. It is associated with the ancient Kushites. Kush (Cush) was Noah's grandson. According to the Matsya, an ancient book from India, the archaic world belonged to the Kushites (Sa-ka) for 7000 years. As can be seen from the diagram above, Seth was a great ruler also. He married a royal daughter of Enoch/Nok. As is characteristic of royal families, the lines intermarried, as is shown in the diagram below. This segment reveals that the rulers had 2 wives. The first wife was the bride of the ruler's youth and his half-sister. Abraham's half-sister wife was Sarah. The second wife was a patrilineal cousin or niece and this marriage was consummated shortly before the heir ascended to the throne. Abraham's cousin wife was Keturah, who gave birth to 6 sons (Gen. 25). With two wives, there were two first-born sons. They ascended to different thrones. The first born son of the sister wife ascended to the throne of his biological father. So Isaac became Abraham's heir. The first born son of the cousin wife became a ruler in the territory of his maternal grandfather, after whom he was named. Lamech the Younger ruled in the territory of Lamech the Elder, not in the territory of his biological father Methuselah. Bishop Ussher was not aware of this unique marriage and ascendancy pattern. The Genesis "begats" and the material in Genesis 10 are annals of ancient royal lines that intermarried. Ruler priests married the daughters of ruler-priests. Only some sons could ascend to the throne. Other sons were sent away to establish territories for themselves. These sent-away sons drove the Kushite expansion out of Africa, an expansion that has been verified by DNA studies. Genesis 2:10-14 says that Eden was watered by four rivers: the Tigris, the Euphrates, the Pishon and the Gihon. The first two are in Mesopotamia and the last two are in East Africa. This is the heart of the ancient Afro-Asiatic Dominion and the place of origin of the ruler-priests and of "him that holds the scepter from the house of Eden" (Amos 1:5). The description of Eden as a well-watered region is supported by climate and geological studies. These four rivers encompass the heart or "Eden" of the ancient Afro-Asiatic Dominion which was ruled by a network of ruler priests. They controlled the major water systems and built shrines along the rivers. From Eden Cain's descendants spread far and wide; his line did not die out in the flood. The lines of Cain and Seth intermarried, as did the lines of Ham and Shem. Abraham, King David and Jesus Christ are descendants of these great ruler-priests. 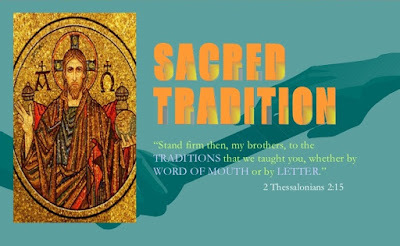 Perhaps this is why Jesus' King-Priest identity was recognized in Tyre in Mark’s Gospel, not on a mountain, as in Matthew's account of the Transfiguration. For Mark, the Messiah’s appearing means the beginning of the restoration of Paradise. Mark was probably thinking of this passage from Ezekiel 28: "Son of Man, raise a lament over the king of Tyre and say to him: Thus says the Lord God: You were the seal of perfection, full of wisdom and flawless beauty. You were in Eden, in the Garden of God; every precious stone was your adornment... and gold beautifully wrought for you, mined for you, prepared the day you were created."